Ziadsouri: I just received bad news. A friend of mine lost his son last night in 7oms. He was a very good young man and a recent graduate of Mechanical Engineering. My friend told me his boy, just like the rest of population, had no hope for the future. My friend and family are in disbelieve. His oldest son, just 24 years, is gone because he dared to speak his mind. They all know who did it. The president’s (or his brother) men did it. They want justice. Does anyone here believe that justice will be served? BTW, my friend is a Christian and I am sure his boy was not an MB or a Wahabi. He was the future of Syria. This regime is killing our future. MajdKhaldoun: We all know very well who did it, it is secret service,working through Shabbeeha,defending the regime, they all criminal, and their end is coming soon. Aboud: Today the regime completely and irreversibly sealed its fate. Homs has now joined the list of massacres perpetuated by the regime, alongside Dar’a and Baniyas. …. Don’t you think that every Syrian wants to believe that the young men in our army are incapable of murdering their own people? Or that we don’t yearn to passionately believe in and rally behind a leader who has our interests at heart? Don’t you think that every mother, father, brother and sister in Syria wants to believe that a bright future lies just beyond the horizon? When SANA put forward credibly sounding explanations that the abuses in Biyada were actually in Iraq, I was relieved. I believed them BECAUSE I passionately wanted to believe that such things do not happen in Syria. So imagine my shock, dismay and hot white anger when their explanation was proven to be a pack of clumsy lies,….We want to believe, but the regime has given us nothing to believe in except clumsy lies. What do you regime apologists expect an entire country to believe in? Roaming cars of shadowy armed men gunning down civilians? Norman: Welcome to the new banana Republic of Syria. Dima: I have the feeling that Bashar Al-Assad will not make it this time. He has wasted 11 years in doing very little for the Syrians. Mina: Another reason why people are not in the streets is that compared to the income of their parents, people are far better off now than 50 years ago. Munif: my first cousin had his wedding yesterday ( actually saturday evening) in Damascus. My mother came down from Beirut and my sister flew in from Dubai, It was at the Nubala’ hall/restaurant. They ate and danced and had a great time. He flew off to his honeymoon. My mother and sister said there was absolutely nothing to indicate that Syria has the issues we see on you tube and on the news. Fadi: The Syrian TV everyday now is broadcasting clips or interviews of life going on as usual in Syria with a title “Damascus today”, “Latakia today”. These are most reassuring! They should play more of them. The contrast of these clips of people going about their daily life is an extreme contrast to the sensational youtube videos. louai: my family lives in Homs Adawya …they can here the Mreja’s Mosque they are calling for Jihad !! my family is NOT mukhabarat so please open your heart and believe ..we all want reform we all want change but not throw those people ..i personally believe Assad and don’t even want a change that is calling for Jihad. Mina: I can’t see how to stop the things getting uglier without announcing elections. Dima: I am in Homs and I know what is going on here maybe we haven’t taped what happened because we were really frightened by the calls for “Jihad” we are not accustomed to these things you know Syria.. i think that all people …now who call for “Jihad” are “salafieen” they call the gradnchildren of “Omar and Abo Bakr” how can i doubt what i see and hear?? this means only that they call for civilian war and now they are threatening Christians (next Friday).. do you think that they are really demonstrators who call for freedom and reforms?? By the way, they call for “Imara” and “Khalifa”.. i am sorry for our media that we Syrian people know the truth and we are the victims but they are unable to broadcast this fact as they should. Paul: My friend george ….. from aleppo is convinced that Muslim Brother types will take over should regime fall. He says that those who live abroad have no idea what its like. This is not to say that mistakes were not made and that things must and will change. The replacement will be infinitely worse. Of course he is biased. He is christian and he is doing well. But we spent hours discussing the situation. Democracy advocates do exist but they will all be swept away by the religious establishment as soon as regime falls. Sophia: I lived six years of the civil war in Lebanon and that left me with a life long trauma. At the end, it is the people who will pay for this dangerous game. Don’t get me wrong. I am all for reforms and against dictatorships but because of my Lebanese experience, if I were to choose between a peaceful dictatorship and a civil war, I will not hesitate. Nothing good comes from a civil war. Civil war kills hope, security and rights. Nadeem: The regime does not have many friends nor does the armed thugs using religion as a cover to bring Syria closer to civil war. I am shocked by the brutality of criminals in Homs who killed in cold blood three army officers and three children. If the revolution allows terrorists to infiltrate its ranks they will lose sympathy quickly and strengthen the regime claim that many protestors are simple thugs who want to kill and destroy. The brutality of security services is not a new story, we have known that for 50 years,the new story is the murderous behavior of assassins in Homs, and other places, who may eventually strip this revolution from its peaceful character and taint the memory of those who died in the name of freedom. Expect the army and the security forces to use more force now,and that is exactly what those thugs want. Paul: I think that history will be very unkind on the baath and this past 48 years. honestly, even if you wanted to destroy a country on purpose, you could not do a worse job. A bunch of ignorant, uneducated, arrogant, bloody, ruthless peasants in charge of a country for 48 years. a habibi. Over 80% of Homs today is inhabited by the flood if farmers who saw their lands destroyed by the incompetent policies of the Ba’ath. Why Discuss: It is amazing how easily the common Syrians are blindly playing into the sectarian master plan without realizing that they are intoxicated by the illusion of an elusive freedom and a better future. How bitterly desillusionned they’ll be when they’ll wake up. Amir from Tel Aviv: This regime is over. Nothing can save it now. Let me predict that by January 2012, Bashar is either in prison or in exile (London? Tehran? Tel Aviv?). NZ: Look in the dictionary for “dignity”, “freedom”, “nepotism” and “corruption”. What is good for you is good for all. Mr. President: I think the only solution is to wait until civil war begins and shows its real danger and pain to the majority Syrians and the world, move the army to crush it. Just as Assad senior did in Lebanon and Hama civil wars. As long as Syria keeps its loyal army intact and safe from western powers all will still be manageable. Riad: Yes the regime is corrupt and yes the security forces are brutal, but can anybody with a straight face deny the obvious: the demonstrators are being infiltrated by thugs and terrorists. That is why Homs suffered tremendous destruction in the last 3 days. No country should allow armed gangs to spread terror and chaos, and this include both Shabiha and anti-government criminals. We need uniformed security officers and the regular army to protect us from both. Enough blood shed and enough destruction. most of my non Syrian friends are asking how Syrians can trust these groups if the regime is toppled. Syrians showed the world that they are brave but some Syrians broadcasted our third world status to a mostly unsympathetic audience. Good luck seeing any foreign money or tourism coming to Syria any time soon. I hope democracy and freedom banners can feed the hungry or bring jobs to the unemployed. Revlon: Stories of mutiny have been substantiated. The allegiance of Armed forces, including the supposedly loyal Republican Guards to the Regime, in their confrontation with unarmed rising public, is precarious at best. It does not apply to the rank and file, who belong to the numerical majority of the Syrian people. The threat of wider mutiny, may explain the quantitatively and qualitatively limited involvement of Army in the current confrontation. Souri: There is no need to say an “Alawi race.” I don’t think the Alawis can in any way be called a different race from the Sunnis. The Alawis used to live in Aleppo, Latakia, Tripoli, etc and they fled to the mountains only during the crusades. …. Before the crusades, most people in Syria were Chrisitan, Alawi, or Shia. The Sunnis were a minority in Syria. The Sunnis became a majority during the Ayyubid and Mamluke wars against the Crusaders. Sick religious scholars like Ibn Taymiyyah tried to take advantage of the wars against the crusaders and they convinced the Mamluke rulers to exterminate the Shia and the Alawis. Many of the racist prejudices that Sunnis hold on the Alawis were invented by this mentally sick scholar. Husam: A month passed and Damascus and Aleppo are largely silent. This means a lot. The regime will build on this and I hope that we see positive and meaningful measures by the government to build trust. … I want deep changes in the security leadership and the removal of many figures that hurt Bashar and the country including his top aides and a crackdown on Shabiha. The only way to keep Damascus and Aleppo on Bashar’s side is to enforce security and end albaath and mukhabarat unchecked authority. Australian-Syrian: We just got a call from my aunty in Tartous. She said that at night they fear leaving their homes as Sunnis from the Hamidieh (not sure if i spelt that right) area outside Tartous are attacking them. Souri: Assad was doing much better in the first few weeks than now. The course events are taking now does not bode well for him. My expectation is that the demonstrations will keep growing and growing …. 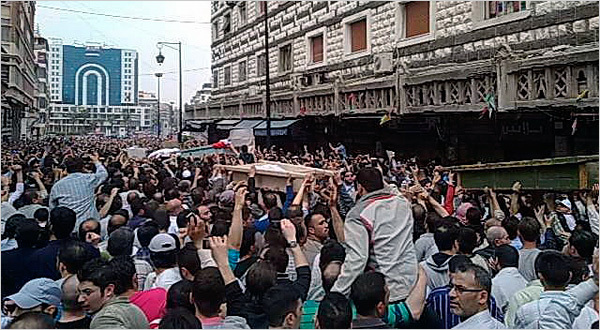 I don’t really know what Assad is waiting for, but if he does not start dealing decisively with these demonstrations soon, this will make me suspect that he has decided to pursue a “local solution” for the Alawites…. The regime dealt harshly with the insurgents in Latakia and Banyas, but has not done the same in Deraa and Homs. This raises my suspicion about the possibility that the regime may prefer a local solution for the Alawites over an all-out civil war. Vedat: The real problem for Bashar Assad is that his proclamations are starting to seem meaningless. ….I wonder how this must make him appear to those around him? Surely this is not lost on those in the military who worry about there own survival. The possibilities of a military coup should not be dismissed. Zoubaida: I read your blog for years. Now I have to say it is over and I can’t take it anymore. I can’t read one more word about Syria you publish. I am going to unsubscribe, just like canceling my Facebook and shutting the TV. I did the same after 9/11. I couldn’t hear anymore. This is a nightmare and it is not ending. I hope God will prove you all wrong and that after the people causing this destruction to Syria get the freedom they want, we, the people get to keep the Syria we love. A Syria that is not part of a Great Israel or greater Turkey. Not part of a Irani / Iraqi Empire or Muslim brotherhood kingdom. I don’t know if prayers are heard but I am praying to God to prove you all wrong. None of you really care about Syria the place or the Syrian people. None of you care to preserve the little we have. We want our Syria back and away from your news. May God prove you all wrong, may God save and protect Syria. ‘Hizb Ut-Tahrir is an international movement that seeks to restore the caliphate, or unite all Muslim countries under one Islamic rule. No one seems to ask why it is only the republics who are chased after by al Jazeera. As if for the west the Arab monarchies, from Marocco to Bahrein, had some sort of inner, divine, legitimacy. That’s not what the American revolution was about, I thought. i am surprised that lots of people convinced that the Regime is making all that chaos…..can you believe that the homeless in the streets or the low life thugs are demanding for Freedom??? ?that’s the last thing could cross their minds…all they care for is how to make extra money and that’s what happened because they got paid by someone to go out and protest and to burn out Hospitals, police stations and schools, but they kept on saying FREEDOM FREEDOM…..
the people responsible for the protests are not of peacefull nature. What I insist to repeat over and over again is the worst thing can happen to Syria is to fall under a Muslim brotherhood (or any other type of Sunni radical regime). The beauty of Syria, its culture, its religious pluralism will disapear from night to day. Whatever may happen let´s hope for a secular regime to reign in. Unhappily it pays into American, Israeli, (AIPAC at least) interest to have a very retrogade Syria. This would perpetuate Syria´s ostracism and “backwardness”. I fear for the religious liberty and existence of Christians, Druze, Ismaelis, Alawites , Shi´ites in Syria IF a non-secular Sunni majority regime comes to power. I´m a 3rd generation Syrian-Brazilian Christian. My 4 grandparents were born in Homs. I agree that executing and mutilating the colonels body, among others, is barbaric to say the least. And, you are right in saying that there is no religion that will sanction this. This is a crime. Certainly Islam does not sanction or justify it. The ones who did this cannot belong to any religion, only to evil and they will definately be punished for their demonic crimes. Unfortunately I did see the video showing Nidal Janoud. May he rest in peace. It was one of the saddest, most disturbing things I have ever seen. Treat those as you would like to be treated I was taught by my parents. The evil ‘peaceful’ protesters behind this and the organisations endorsing these demonic actions will one day live to regret their actions. May that day be soon. Yesterday, Aldiyar journal published a very important article to understand what happens in Syria.